2018 is the 100-year commemoration of the Influenza Pandemic of 1918. 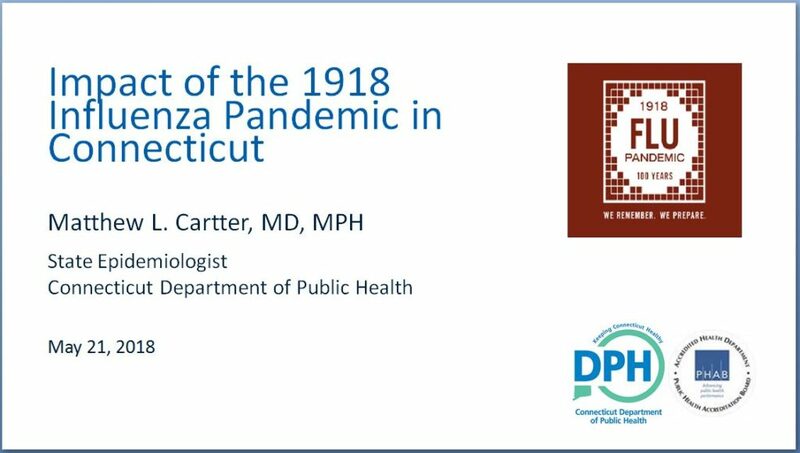 Matthew L. Cartter, MD, MPH, State Epidemiologist & Director of Infectious Diseases at the Connecticut Department of Public Health, presented a version of this slideshow at the 36th Annual Conference of the Connecticut Infectious Disease Society (CIDS) on Thursday, May 17, 2018 at the Yale West Campus Conference Center, 100 West Campus Drive, Building 800, Orange, CT.
Dr. Cartter used the Bridgeport Times and Evening Farmer and the Norwich Bulletin, both of which were digitized by the Connecticut Digital Newspaper Project, for his research. To view the slideshow, click on this link. To view Dr. Cartter’s remarks, click on the little yellow square in the upper left corner of each slide.